If you enjoy listening to music and you’re looking for an inexpensive way to breathe new life to your old audio system at home, then the new Google Chromecast Audio is just what you need. Google Chromecast Audio allows you to wirelessly get access to a world of instant entertainment and stream a millions of songs, radio stations as well as podcasts from popular apps like Spotify, iHeartRadio, Pandora and Google Play Music. This easy to use device uses WiFi instead of Bluetooth which means you can stream crystal clear hi resolution sound through your wireless home network system. You just need to plug one end of the stereo cable into the Chromecast Audio device and the other end into your audio system. If your audio system is of the older version and does not have HDMI ports, you don’t have to worry because the Chromecast Audio works with a wide range of audio systems. You then download the Chromecast App to your Android or Apple mobile phone or tablet and follow the simple instructions. Once you connect to your WiFi network, you tap the Cast icon on your mobile device and your music will start playing through your home audio system. Because Chromecast Audio uses WiFi instead of Bluetooth, you can stream crystal clear hi res sound. ○ By using your phone, it’s easy to play, pause, or change the volume from anywhere in the home. And while streaming, you can still text or call without interrupting what's playing or draining your battery. 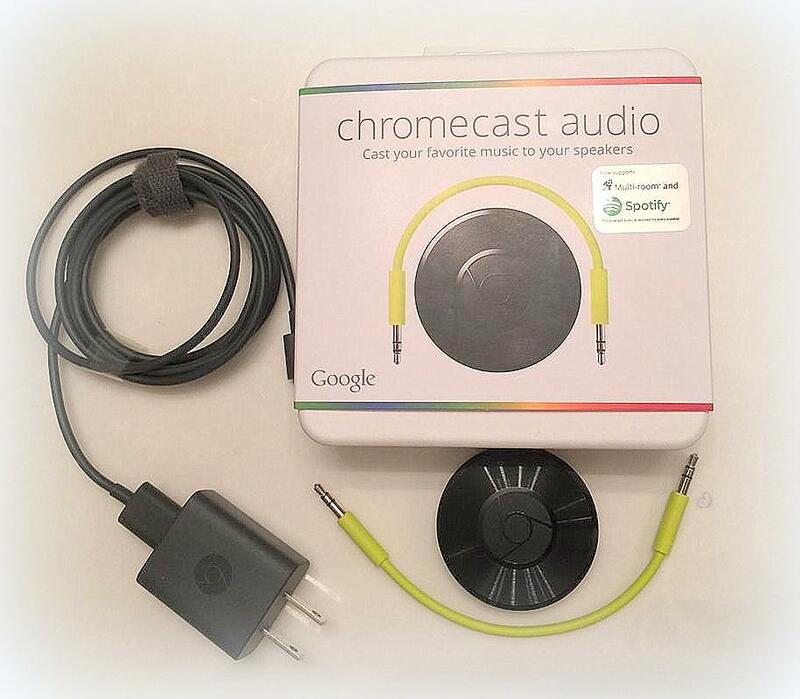 ○ Use Chromecast Audio to stream over Wi-Fi which has many advantages over Bluetooth including higher sound quality. i) Now you can easily fill every room in your home with synchronous music. Simply group Chromecast Audio devices together so you can listen to the same song on multiple speakers. Get your own Google Chromecast Audio at Best Buy now and experience a whole new way of bringing your favorite songs, radio stations and podcasts right into your home. I can't wait to get this! I have the old one and I know there has been SO Many updates since then! We listen to music all the time in our house. We would use this every day. My teen son would love this. I should get one for hm. We got one of those this weekend, and it's awesome! I love streaming my jams through our big entertainment speakers. I love my Chromecast Audio. It makes it so easy to play my music anywhere. I had to buy my Son one so he would stop taking mine. I've been reading a lot about how awesome this gadget is. I would love to get one for my son. I really love my Chromecast and my son too. My one of my friend is so excited, her Chromecast will release this weekend. I can't also wait for my Chromecast tomorrow. So excited to try it. I like the fact that Google Chromecast looks fairly easy to use. If it's user-friendly, then sign me up! I love Chromecast! It truly is a life saver. I love this new one, so that will be cool to use. This is so cool. We already love Chromecast, but this new audio streaming feature makes it even better. Thanks for the tip. Cant wait to try. The latest technology in music where you can bring the best music wherever you go. Thumbs up for that. I've heard this from my one of my friend and I think it's amazing to try! This is so cool! I would love to have this for my husband! He'll love it! I keep seeing this new electronic. I must test it out. My son got his own Chromecast audio and I would say it does as it says it will. He loves his music, even more so now, when he can stream music to his ginormous speakers. I love listening to music so i cant to have this. This sounds like exactly what I need! I'm so tired of listening to music and podcasts through my crappy laptop speakers. I love my Chromecast - both the audio and the video. I listen to music all the time, and this is great! I read about this recently and it sounds like a nifty little gadget! Must go get one soon! I'm seeing Chromecast everywhere and it looks totally amazing. I might have to give in and pick one up today. I can't believe I haven't heard of this yet! I need to get one pronto! I haven't tried this out yet but it really seems like I need to! It looks like a ton of fun and a great electronic to have! Google chromecast is our favorite way to stream netflix and other shoes. I need to grab an Audio chromecast now. I need to go to Best Buy and check this out! I think it's what we need. This is so neat! I know my daughter is going to love this. I think this is really awesome. I've heard a lot of good things about it. I love listening to music at home and this is a must have. I have these also and totally love them. What a great accessory. I have heard many great things about that product. I find it interesting and I'm really excited to have one! I love listening to music. this will be a great one for me. I don't need to buy new audio system and that's awesome! That is neat! We are music lovers over here. I would certainly love to have that. What a nice new product! My husband would surely love this as a present! I have the regular Chromecast and was able to make 5 more friends buy it. Ha! And I was not paid by them. Here's another Chromecast product soon to come our way. I've heard so many great things about the Chromecast. I've been looking into getting one myself, it looks so easy to use! These look so small and handy. I'll have to check it out. I've been hearing a lot about this product. Definitely need to check it out soon. Seems like one of those must-haves. I've seen this a couple of places now, may have to check it out, I like having options. I am not sure but as far as I remember, I have already commented to a similar post before. It is about Google Chromecast audio as well. It is the first time that I have heard of it. If it works well for you then it might be a good try. That would be nice to have, if only I can afford it lol. Seriously though, one of the parents from the kids school have this and said that they love it.